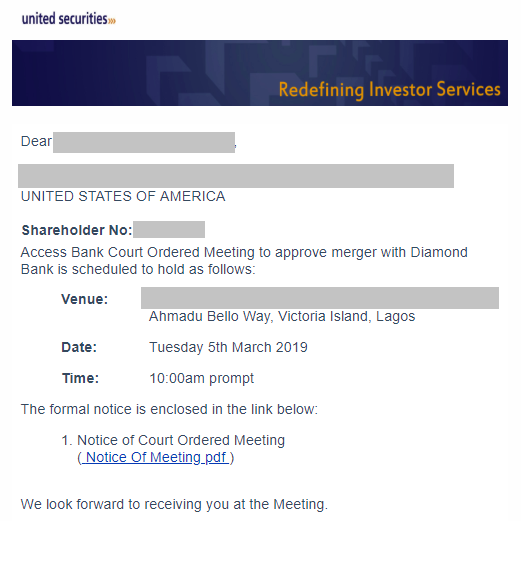 Access Bank has sent invitations to its major shareholders to attend a court-ordered meeting to approve merger with Diamond Bank. On March 5th, I will vote YES for the merger since there is no alternative. Access Bank few weeks ago noted that it was merging with Diamond Bank. I want to wish Access Bank CEO, Herbert Wigwe, my 2018 Businessperson of the Year, the best of luck as he executes to create values for all stakeholders (not just us the shareholders). For students of finance, you can read the Scheme of Merger document sent to shareholders.